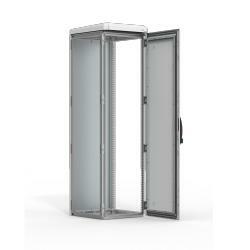 This aluminium double wall, single door combinable enclosure, ECOM, is designed for outdoor use. It is available off the shelf in many several dimensions, and allows for the creation of many different configurations, since it is combinable. With a high IP 66 protection degree, anti-vandalism features, and effective thermal management capabilities, components within the enclosure will be very well protected. Aluminium ALMg3. Door: 2 mm. Rear panel: 2 mm. Rain hood: 2 mm. Bottom plate: 2 mm. AISI 304L pre-grained stainless steel. Frame: 1.5 mm. Seam welded reversed open profiles with 25 mm hole pattern according to DIN 43660. Double walled with top and bottom ventilation openings, allowing air flow. Mounted with concealed hinges, allowing left or right hand opening. Double walled with top and bottom ventilation openings allowing air flow. Fastened from the inside. Standard facilities for rear door mounting. Sloped rainhood with integrated rain gutter and ventilation channels around the perimeter. Espagnolette 4-point locking system. Does not interfere with the enclosure inner space. Standard lift handle with security lock. Internal panels are earthed through their fittings and are equipped with a separate earthing stud. RAL 7035 structured powder coating 100% polyester. Complies with IP 66 | TYPE 4X, 12, 13 | IK 10, when bottom plate is fitted. Frame with fitted door and lifthandle, rear panel and rain hood. Delivery also includes earthing bolts. Delivered on a pallet which is identical to the width of the enclosure to allow baying without removal. All packing material is recyclable. Mounting plate and side panels are not included in the standard delivery. Aluminium double wall, single door combinable floor standing enclosure, for outdoor use, with a high IP 66 protection degree. An enclosure available off the shelf in many different dimensions, allowing for the creation of configurations made of smaller, individual enclosures. Components installed will be well protected thanks to the high protection degree, anti-vandalism features, and thermal management efficiency, which is especially advantageous when exposed to sunlight. The enclosures will be delivered quickly, and with many different sizes available engineering time can be reduced as well as the risk for oversizing. Downtime due to component failure is minimized thanks to the enclosure's thermal management capabilities. Aluminium side panels, SPMA, must be ordered separately to close individual enclosures or enclosure assemblies. Proper closing is needed to ensure the stated protection degree is fulfilled. Bottom plates, CBPA, if required, must also be ordered separately.